Now it’s time for Experiment No. 5 from Mandy Aftel’s book, Fragrant: Frankincense Solid Perfume. This perfume claims to be all about Frankincense – but the true star is the amazing deliciousness of Fir Absolute. Heaven! This smells like a walk in the forest in the best possible way. 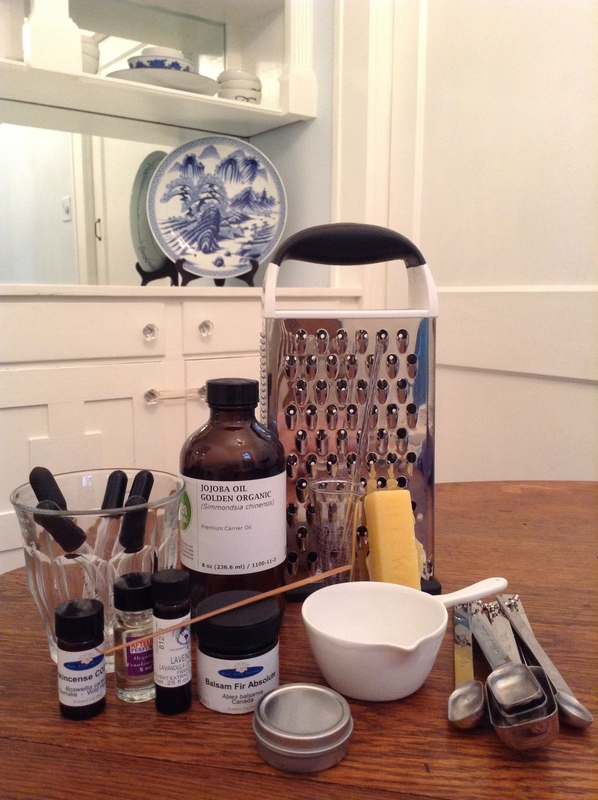 Supplies for creating Frankincense Solid Perfume. *Out of courtesy to the author, I’m leaving off the amounts of each raw material. You can find them in her book. Cover your work surface with paper towels. Add the Jojoba oil to the graduated beaker. Next, measure out each of the essences into the beaker of oil. Start with the fir absolute. It’s incredibly viscous (like tar) – so what you need to do is use the curette to scoop out a drop-sized blob of it, and then stir it into the oil. It won’t dissolve – that’s ok. It will melt when you add it to the beeswax. Then, use the eye droppers to add each of the other essences. When you are done with an eye dropper, place it in the glass of alcohol, and pump it a few times to clean it, and leave it sitting full of alcohol. This will prevent cross-contamination and also dissolve any EOs left on the dropper to make clean up easier. Once you have your oil blended, switch to working with the beeswax. Measure out the grated beeswax into the lab casserole. Hold the lab casserole full of grated wax over the burner until the wax melts. You don’t want to burn it, so keep the temperature at “medium” or lower. When all the wax has melted, quickly pour the essential oil blend into the liquid wax. Working over the heat, stir the blend into the wax for about 10 seconds until it’s a smooth mixture. The fir absolute should melt just fine! It may leave some sediment, but that’s okay – it still will look fine as a solid perfume. Finally, pour the molten perfume into the ½ oz tin, cap it, and leave it alone for 15 minutes to solidify. Don’t touch it or you’ll burn yourself and/or mess up the nice smooth surface. Finis! How did it work? How does it smell? Oh my stars in heaven, this stuff smells AH-mazing! You really get the fir absolute, supported faintly by the lavender. It’s very sweet and balsamic, almost edible. Love, love, love it. This was a more challenging solid perfume to create simply because working with the fir absolute is a hassle – but WOW, is it worth it! The frankincense I can’t detect as much – but interestingly, this DOES remind me somewhat of the way a chunk of frankincense resin smells (sweet, balsamic, piney). Whereas Frankincense EO doesn’t have precisely the same character as the resin itself. So it’s almost like this is a recreation of the raw material. But, frankly, better. Did I mention I am now in love with fir absolute? It’s strangely edible. A magical edible pine forest of wonderfulness. Lavender Absolute, France, Liberty Naturals – Beautiful. Soft but also very intense. Blanket quality. Calming. Herbaceous. Cooling. Soothing. 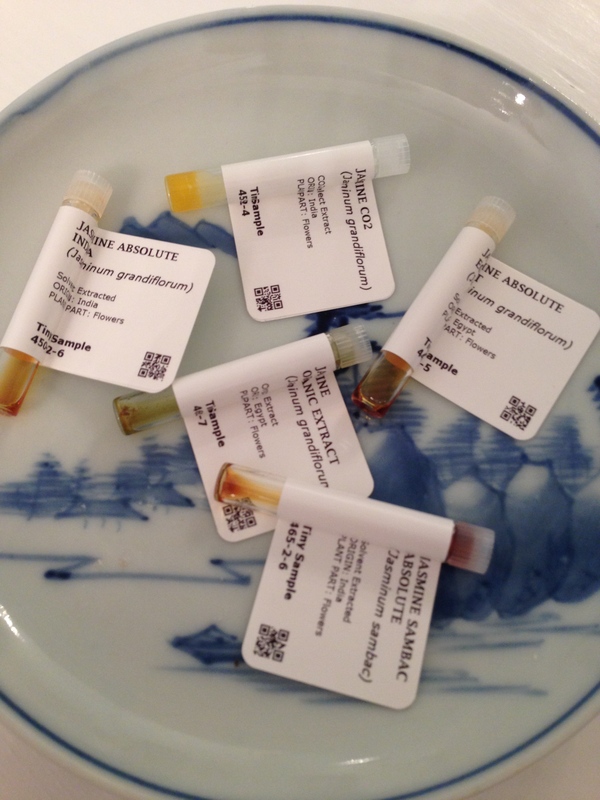 Frankincense CO2 Select, Somalia, Wild Harvest, White Lotus Aromatics – Similar to the EO but more pleasant. Piney. Still very pinene-y but more ethereal. Next time I get Frankincense, I want to use Enfleurage. They seem to be Frankincense experts and I’d love to sample their stock. I’d like to try the Frankincense from Oman, boswellia sacra. For a formula I’m trying out, I need a single drop of jasmine. Just one! But which jasmine? My favorite jasmine is the one that grows wildly over my back courtyard wall – Confederate Jasmine (also called “Star Jasmine” or “Chinese Jasmine”) – which loves hot climates and flourishes all over the Southern US. It has an aroma that’s honey sweet, fresh, and narcotic. At the height of blooming season (late April-early May) just walking out into the garden is like walking into a humid blanket of scent. The intoxicating fragrance brings an immediate smile to my face, and a quickening of the senses – while at the same time making me feel lulled and drowsy. Meanwhile, my ears fill with the thrumming buzz of the honeybees. The combined effect is nearly hypnotic, and I often find myself drifting over to smell the blossoms like a sleep-walker. Still, this is a fresh jasmine, and the scent of a living flower is impossible to capture perfectly in the natural raw material. When we smell a flower, we are actually smelling the volatile molecules in the air around it. The air around the flower has a different chemical makeup than the essential oil, concrete, or absolute once it’s extracted from the plant – so the flower extracts can never smell the same as the living flower on the stem. Perfumers are forever using their noses and intuition or more recently, fancy headspace technology and gas chromatography to analyze the “living scent” of a flower and try to reproduce it. The late, hilarious Alec Lawless of Essentially Me UK created some videos explaining how gas chromatography can be used to fake an extremely expensive rose otto. The whole thing spoofs the clandestine nature of the perfume industry through an “interview” with a masked man whom I suspect is Lawless himself. Anyhow, it’s informative and funny, and worth watching if you’re curious about gas chromatography. ANYWAY. Back to the matter at hand: Choosing a jasmine. Eden Botanicals conveniently offers a jasmine sampler pack – so I purchased that and began sniffing my way through it to compare the scents and pick one for my blend. 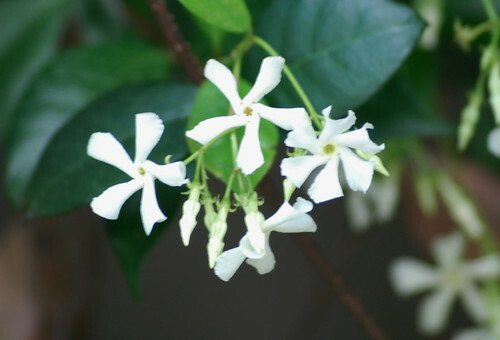 Jasmine Absolute, Grandiflorum, India – Grandiflorum is the classic jasmine. This one is beautiful, white floral, narcotic, extremely sweet with great longevity. There is no plastic-y note that I sometimes detect in jasmine. This one is rounded, rich, and voluptuous. It’s so sweet there is almost a boozy-quality to it. The liquid itself is dark yellow-orange. Jasmine Absolute, Sambac, India – Sambac is typically a spicier jasmine than Grandiflorum, and this one is true to character. A gorgeous jasmine that is spicier, greener, and less sweet (though still very honey sweet!) – fresher even? – than the Indian Grandiflorum. Reminds me instantly of honeysuckle and sparks a flood of childhood memories. Lots of character. Intense. Perhaps my favorite of this set. Liquid is dark amber color. Jasmine Absolute, Grandiflorum, Egypt – This Grandiflorum is very similar in character to the one from India, but to my nose of lesser quality. Less sweet? Less fresh? Still very pretty and nice though! It just doesn’t elicit the silent “wow” of the other. Drydown is very soft and pretty, and less intense/strong than the one from India. Jasmine Grandiflorum Organic Extract, Egypt – This jasmine was altogether unique – very different from what I am used to. It’s extracted using benign solvents, so it’s certifiably organic and very safe for aromatherapy. Neat! It is a green color, with some particles. The scent itself is soft, very slightly medicinal?, cooling, sweet, a bit spicy/tangy – almost with a hint of Anise? It’s very hard for me to describe, and doesn’t read as classically jasmine, but is a beautiful, tranquil, and very calming and pretty scent. Jasmine Grandiflorum CO2, India – This would be hard to work with for the beginner (moi!) it’s a waxy yellow concrete paste. Might be good for solid perfume? At first, I did not like the scent of this one very much. But I noticed that it lasted a long time on the scent strip, and lingered pleasantly. Ultimately for my blend I chose the Jasmine Grandiflorum from India. It’s voluptuous, rounded quality might work well to bring together the spicy notes I will be working with. Still…the Sambac and the Organic Extract both piqued my curiosity – and I’d love to work with them in the future.